Mobile operators Bharti Airtel and Aircel on Monday began taking pre-orders for Apple's much-awaited iPhone 5 ahead of its retail debut in the stores on November 2. Both operators opened preorders starting at Rs 45,000 for the 16GB variant while the 64GB model has been priced at Rs 59,500 according to the listings in their website, and have also promised to ship the product within 7-8 days. In comparison, the iPhone's direct competitors such as Samsung Galaxy S III and HTC One X are available in India for about Rs 35,000. Executives with all leading mobile operators also confirmed that nano SIM cards that support iPhone 5 will be available in their outlets beginning November 2. The earlier versions of Apple's phones including the iPhone 4S used microSIMS. Apple has also changed its strategy and has decided to make its latest handset available to customers independent of their mobile operators. This allows customers using the services of any carrier to buy and directly use the iPhone 5 without having to unlock the handset. So far, all versions of the iconic iPhone were locked to the networks of either Airtel or Aircel and had came bundled with subsidized plans from these carriers. Rather than directly selling only through these two operators, Apple has now appointed Ingram Micro and Redington as distributors for selling the iPhone 5. Both distributors had opened prebookings on their websites last week and industry executives tracking Apple's latest offerings claim that initial response had been far higher than market estimates. Apple users in India have more reasons to cheer as the American technology giant has also decided to allow Rupee-based billing in its application store, a step that will allow customers to gauge the exact amount they will have to pay-up when they buy an app from its portal. Besides, this will also enable Apple to take on Google's app store that charges in rupee. Executives with both Airtel and Aircel say that attractive tariff schemes and free minutes for the iPhone 5, which they would unveil soon, will offer a unique advantage to customers who opt to buy the gadget from them. "This time around, the price in the retail market as well as that offered by us (Airtel and Aircel) will be identical. But, bundled schemes and free minutes that will be part of special tariff packages that are tailor-made for the iPhone 5 will ensure that our customers recover a significant part of what it cost them to acquire the phone," said an executive with one of these carriers. The official launch will also kill the thriving black market for the iPhone 5. Last month, ET had reported that on websites such as eBay.in and Olx.in, customers were ordering the phone for upwards of Rs 58,000 for a 16GBdevice. The 32GB version was selling for Rs 94,000 and 64GB for Rs 1.06 lakh. 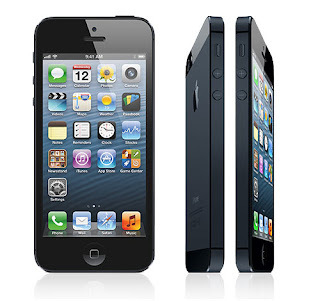 The iPhone 5 is capable of offering blazing Internet speeds on a 4G/LTE network. Not in India though, as the country's designated 4G band is different from the international standard used by Apple. In this regard, the new iPhone will be no different from the previous iPhone 4S.